If Donovan Smith gets paid is not the question. It seems the question about the Bucs left tackle is, how much? Gary Davenport of Bleacher Report seems to agree with a lot of Bucs fans when he thinks changes are a-comin’ on the offensive line. The more Joe thinks about it, the more Joe believes Smith is returning. Bucco Bruce Arians has stated he’s not about rebuilding. Unless Trent Brown is on the market, finding a new left tackle is very much rebuilding. Besides, Brown may cost more cash than Smith and the Bucs would have to sacrifice who to get Brown, Adam Humphries and DeSean Jackson? Only the shrill people who like to hear themselves holler and who have their heads buried in the sand on Treasure Island don’t remember the 2014 edition of the Bucs offensive line. That was truly a horrid cast of characters with Anthony Collins, Patrick Omameh, Oneil Cousins and Garrett “Whoops!” Gilkey, who hadn’t played center since high school yet inept Lovie Smith deemed him NFL-ready at the position and Gilkey responded by regularly snapping the ball over Stewart McClown’s head. Well, Bucs running backs averaged 3.9 yards per carry that year. And what did Bucs running backs average this year? You got it, 3.9 yards per carry. As Joe has been writing for years, it’s the running backs. The team averaged 4.8 yards per carry that year. Bucs have yet to replace Mankins production. Oh, he is coming back!!!! That’s the Buccaneer way!!!!! Overpaying for subpar, inconsistent performance!!!!!!!!!!!!!!! We are fans and understandably get emotional and excited. We remember certain plays that left us cursing out the TV screen. However it’s time to drop the emotion and hyperbole…it’s the part of football that isn’t nearly as much fun as the rest. I trust that BA and Licht are well aware of this. They look at Donovan’s overall performance. The coaching staff did not go to the Senior Bowl so they could remain in Florida and scour the video of our current players. They have put in the work!!! We have a few posters here who really put in the work…LUV comes to mind and there are others. But with all due respect they have not viewed a fraction of the video our new coaching staff has already seen. They do not have the experience of the braintrust that now is coaching the Bucs. So I’m going to wimp out and be a snowflake. I really do not have an opinion on whether to keep DS or not. I’ve read arguments on both sides. I lean towards keeping him because an average LT in the NFL would rank in the middle…or at least the “median” LT would be around 16 or so. That SEEMS about where DS falls. So…what is an average LT in the NFL worth? What is a player who lines up EVERY Sunday worth? Who will take his place? I don’t have the answers but I have faith in our new staff. It’s up to BA and the boys to come up with the right answers to these questions. I enjoy reading everyone here but I gotta go with the decision of the coaching staff on this one. Wait, I may not be understanding your logic here. You just get done talking about how crappy the 2014 line with Collins, Omameh, et al was, along with the 3.9 ypc. In the next sentence you note that this years ypc was exactly the same. This would seems to imply that the problem was again (still) a crappy line. Then you say….it’s the running backs? I don’t follow. Naw, that’s a bit short sighted. Do they need upgrades? Yes absolutely. However, the left side of our line from center out, is adequate or better. If you can’t run to the right, that severely limits what you can call and defenses are gonna slide their line heavy to the left side on expected run downs(since they watch tape too), making it harder to run to the left. Boom, 3.9 yds a carry. Secondly, will Humphries resigning really take 10 million annually? Then smith should get the same opportunity. joe never wants to admit that in 2015 the oline was decent constructed by lovie since we all know he had final say in the roster…..martin finished 2nd in the league in rushing that year…..yeah lovie gutted the oline in 2014 but it was a strength in 2015….those were fun times….lol…. 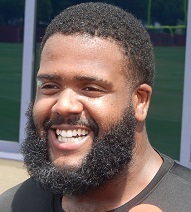 doesnt matter if its hump or djax, both will be “sacrificed” due to the cap situation….and it would be smart to still draft 2 maybe 3 olinemen to replace dotson and benenoch and develop depth…..tytus howard, martez ivey and chuma edoga will be there in the mid rounds…..
I’d tag him. Show me year. Last year was show me year and he didn’t really impress. A leopard just can’t change it’s spots but maybe Arians and Kugler can get through to him. Why is there no mention of Warhop? I always thought he wasn’t very good. I don’t think it’s possible to be a fan and know what the coaches know. So even if we bring in a new LT and he appears worse than D Smith, we still won’t know the value of the players we DID use the money on until the season starts. Maybe they think Jonah Williams will be the best run blocking LT in the league and because they plan to get the ball out quick, beating the LT around the edge won’t matter as much. We won’t KNOW until we see them play, so let’s not get carried away blaming them for something stupid like years past!! I’m gonna enjoy watching this staff work!! Also, I watched Ivey as a Gator fan for several years, and since his surgery he has clearly lost a step. Moved him from Guard to Tackle and he got torched by Josh Allen and Montez Sweat, so that’s a HARD PASS for me. Just because he is rated as one of the best 5 star recruits ever for the gators, doesn’t mean he will play in the NFL. Some are saying he would be better off as an unrestricted free agent and play based on skill eventually…..
Ben Powers in the 2nd I can agree with. We already need a new right side of the O-Line and that’s a y’all order in one off-season. Don’t make your problem worse by “Fixing” Left tackle when you have nobody to replace DS with. Nobody. There is plenty of money to be saved along the D-line with a few guys either taking big pay cuts or hitting the bricks. Curry, Gholston and Gerald. Can’t overpay for their non-production. I want GMC back, but at about half of what he is making. NO!!!!!!!! Did you watch the film on the Alex Okafor article? His fat, slow a$$ gets ran around off the edge every game!!!!!!!! If you are so worried about LT (which you should be), than go out and make that your FA or trade splash move in the offseason to a proven quality LT!!!!!!!! Don’t give this fat, slow, guy that jumps constantly a huge sack of cash!!!!!! BYe BYe !! he aint worth what he thinks he is. He doesn’t deserve to be paid big $ on this team. You have to earn the raise, not just get it because your a FA. IF some other teams want to pay you big money, the God bless them and good luck. i guess we can agree to disagree…..imo, ivey showed good lateral movement, footwork and uses his hands very well….he does have a little trouble with the bull rush….his injury effected his mobility no doubt but i fought thru it and had a great year….josh allen and sweat won some battles but so did ivey….i’ve seen him stone wall those 2 in reps this year and in the past…..
j.taylor was our best lineman….its a reason why he stayed at RT and thats no disrespect to him…..they tried switching him to LT and had ivey at LG when mac got fired mid season and quickly realized ivey is best suited for LT……taylor can play LT but he wasnt as dominate as he was at RT who imo, is the best T in the draft class…..
btw, imo if we draft j.taylor he could be this years q.nelson…..
Who the hell is saying Hump is in the $10 million range??? I hope not Hump and his agent cus they’ll never get a deal done. $6-$8 million. Agreed. Liedtke has amazing strength and quick off the snap. Video on YouTube of him straight up wrecking JPP in practice. We know he did amazing last year in TC and PS. If he does it again, I would have no problem at all starting him game one. not opposed to that….i hope both win the job…. You know, he’s not talentless. In fact he could be the best Pro Bowl RT in the league @RT money. Really I’ve never really thought D. Smith was so bad as they say until this past year. He proved all his naysayers right in 2018. Easily his most pitiful season as a pro. What I’d like to know is why the frig his rookie season was better then his 4th year? That is absolute BullSpit!! This guy was expected to improve a develope following his rookie year……..You know, like any freaking lineman that has ever played in the league. It’s inexcusable that this guy gets progressively worst every stinking year. How much do you pay this guy? You pay he what he earned. One friggen year. No more. No way you guarantee this dude multiple years when he has done nothing but regress. That’s asinine…….And if they do decide to give him multi years they better darn well give us immediate results. Sick of this franchise paying all this money for dog crap performance…….And D.Smith is our player so there no excuse at all. If Bruce can’t evaluate his own team he will be in the same place as the last guy. How about the last guys evaluation of Benechot? I mean what in the actual ****? Didn’t these jerks know what a NFL Lineman is supposted to look like? That was what rock bottom looks like. Worst coach in franchise history. jimmyjack says: What I’d like to know is why the frig his rookie season was better then his 4th year? 813 I agree with that. I also think a huge factor was also that Dirk changed our running scheme in 2016. And he changed the personal packaging and the formations we ran out of. The crime was that we were a top 5 rushing team and Dirk’s decisions ruined it. All the guy had to do was keep the ball rolling on offense and get our defense up to snuff. Very pathetic. Dang, this is all over the place. Can’t believe folks are comparing the stats of the 2014 & 2015 Bucs’ OLines without mentioning that the two lines were completely different except for ONE players: Logan Mankins (all the rest of the starters changed). And I’ll still contend as I have for a long time that the only reason Donovan & Ali did as well as they did their rookie year (2015) was because of Logan Mankins. Great FIELD LEADERSHIP plus the talent upgrade made all the difference. 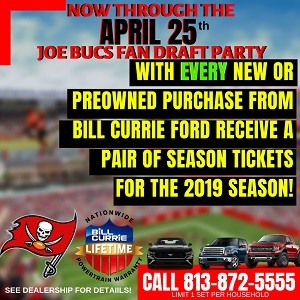 The only real alternative that the Bucs have paying Donovan is to draft a LT in the 1st round to be an immediate starter. And even that’s risky as all git-out. What if the rookie gets injured? What if he doesn’t work out starting at LT? Take a close look at our OLine to see who’ll back him up. It’s nice to say Wester & Liedtke but then ask yourself why they both got minimal offensive snaps last year. We can’t fix everything in 1 year … they’ll franchise tag Donovan (as a minimum) just to buy some time. And Joe, I for one agree with you that it’s the RBs. But it’s also the OLine. And it’s also the coaching. And it’s also the play designs & play-calling. Hard to say which has sucked worse at this point. things got predictable with the formations and personnel…. all i know is, when marpet and d.smith were drafted their strengths were run blocking…..every scout agreed with that statement….the film matched those statements….as rookies, our offense involved heavy ground and pound….d.smith and marpet excelled in “that” offense…..in 2016 things changed from ground and pound to air it out….more pass pro less run blocking which exposed their weaknesses….both d.smith and marpet regressed imo…same can be said about winston….LM was a great leader but i believe the scheme put them(the oline) in position to be successful which led to martin finishing 2nd in rushing…. but it is what it is now….we have a new staff and hopefully they can develop the players that are/will be on the roster…. So how about giving up tons of QB pressures. One of the worst teams in QB pressures given up? Largely agree with your takes about D.S. I do not about Wester and Liedtke. It would seem to makes sense that if either were that good we would have seen more of them…except in the NFL it seems coaches are generally just too conservative to give the next guy in line a real chance. I thought this was a particular weakness of Koetter’s and we don’t know how much Warhop figured into the calculations. But they’re not the only ones…Chucky was obsessed with vets as well and good luck trying to break into his lineup unless the vet got hurt. What’s Licht’s game plan if Smith holds out?…Then what, move Marpet again? Licht isn’t good at his job…He’s constantly in bad situations that are complete misses or grossly overspends for mediocre results.